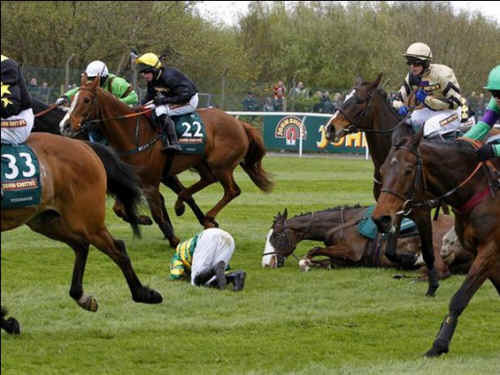 Yet another disaster yesterday at a big horse race. 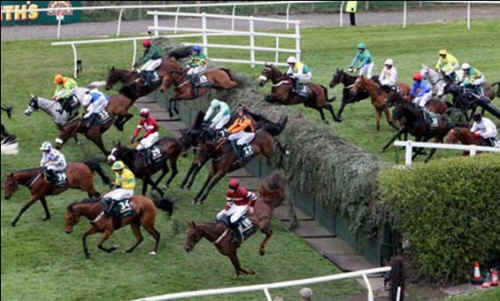 At the U.K.’s infamous Grand National, where the contestants race around a dangerous obstacle course, two of the contestants stumbled, broke their legs, and were put down. One of them was the favorite, Synchronised. The name of the other was According to Pete. Both horses went down at the sixth fence of the 4½-mile, 30-fence race. Another two horses also fell and were receiving veterinary treatment. Synchronised threw his rider while jumping a particularly dangerous obstacle, Becher’s Brook, then galloped away, tried to jump another fence and broke his leg. According to Pete was pushed over at Becher’s Brook by another horse on the next circuit. Including yesterday’s deaths, the toll of horses killed on racecourses this year has already reached 41, according to the British Independent newspaper. In March alone, 23 horses were fatally injured. In fact, there’s no way of making the Grand National into a “safe” race – any more than you can make rodeos or bullfighting safe. The whole point of it is that it’s dangerous. Even the racing establishment agrees on that. “[The race] has inherent risks,” admitted Tim Morris of the British Horseracing Authority. “But, working closely with Aintree and other stakeholders, we do all we can to minimize these risks while maintaining the unique character of the race.” And by “unique”, of course, he means dangerous. The race was won by long-shot Neptune Collonges, whose odds were 33-1. That certainly pleased his trainer, Paul Nicholls. Mr. Nicholls seems to miss the point that if people like him want to risk their lives – on bicycles, skateboards, skis, or any other inanimate object, that’s their business and they’re more than welcome. But we don’t have to “live with” putting the lives of unconsenting animals at risk – indeed in extreme danger. We simply have to put a stop to it. And it is the likes of Paul Nicholls and the racing establishment who need to grow up and move on to better ways of entertaining each other than injuring helpless animals. © 1998-2011 The Mary T. and Frank L. Hoffman Family Foundation. All rights reserved. May be copied only for personal use or by not-for-profit organizations to promote compassionate and responsible living. All copied and reprinted material must contain proper credits and web site link www.all-creatures.org. All Creatures Animal Rights Article: justice, peace, love, compassion, ethics, organizations, Bible, God, Lord, Jesus, Christ, Holy Spirit, grass roots, animals, cruelty-free, lifestyle, hunting, fishing, traping, farm, farming, factory, fur, meat, slaughter, cattle, beef, pork, chicken, poultry, hens, battery, debeaking. Thee is also a similarity to the human aspects of prolife, pro life, pro-life, abortion, capital punishment, and war.